There are a number of cruise ships that come into the Paihia, Waitangi, Bay of Islands area. Sometimes we can even get two ships in the Bay of Islands on the same day. The Bay of Islands is a beautiful place that consists of 144 separate islands. Because of the beautiful scenery and the idyllic lifestyle, the Bay of Islands has become one of New Zealand’s most sort after tourist areas. How does renting a car from a cruise ship work? If you are looking for a rental car for your day trip to the Bay of Islands, Epic Rentals should be your first port of call. We have a very easy to use booking website where you can quickly and easily organise your rental car for your stay in the Bay of Islands, from your Cruise Ship. Because there is no wharf large enough to take a cruise ship in the Bay of Islands, all passengers must come ashore via a tender. When you get off the shore tender we will be standing at the end of the wharf with a sign with your name on it. Just make yourself known to us. If you have booked online and put in your full details (drivers licence etc) then there is just a 2-3-minute handover of the keys and walk around of the vehicle and your off. Epic Rentals knows how important it is to maximise your time when ashore, so we try to get all the paperwork completed before you even arrive. We can supply a GPS for your vehicle if you are planning on tripping around, (you don’t want to get lost and miss your cruise departure). The cell phone reception around Northland can be a little testing at times as we have a limited population and a bit of a rugged terrain. If you don’t know the area well, I would suggest a GPS. You can book your GPS when booking your cruise ship rental car with Epic Rentals. When you return, there is a couple of things that can happen. First if you return at the agreed time then a representative from Epic Rentals will be there to meet you and complete the handover procedure. The other option is if you return early, just park the car in the same carpark as when you uplifted your cruise ship rental car, lock the keys in the car (check you have all your belongings first), take a few photos on your phone or camera of the car showing that when you returned your vehicle there was no damage. What are the drive times from Waitangi to local areas? Waitangi to Paihia is about 5 minutes. Waitangi to Kawakawa is about 25 minutes. Waitangi to Kerikeri is also about 25 minutes. Waitangi to Whangarei is about 1 hour 15 minutes. Waitangi to Kaitaia is about 1 hour and 30 minutes. All drive times are approximate and over the busy months allow a little more time as we don’t want you to miss the return tender back to your cruise ship. 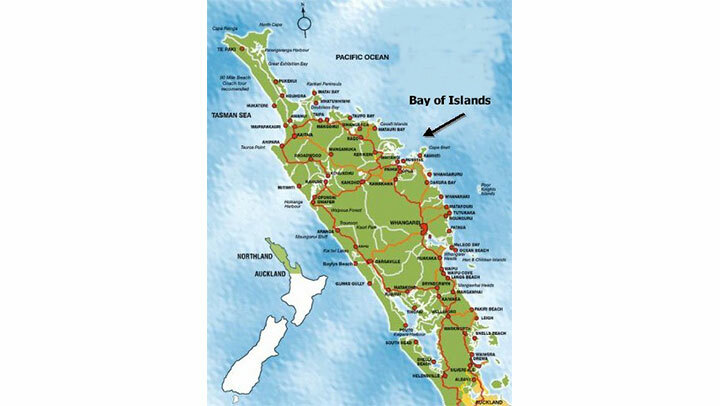 As mentioned earlier there are 144 islands within the Bay of Islands. Both Paihia, and Waitangi are located on the shore on the inner side or western edge of the Bay of Islands. The people that live in and around the Bay of Islands are generally pretty relaxed, and content with life. Because of this you can find the nicest people, who will often just stop off and have a chat with you if you would like. Of course, if you just want to get things done in a short time we all understand that also. Kerikeri is the real hub of the Bay of Islands. It’s not too far from where you depart your cruise ship and pick up your rental car, about 25 minutes. In Kerikeri you have all your major shops and supermarkets like Briscoes, Rebel Sport, Noel Leeming, The Warehouse, Countdown, and New World. It is abundant with cafes and lots of things for the tourist to do. Paihia is the hub of the tourist area within the Bay of Islands. There is not so many big name shops here, but there is lots of souvenir shops and activities for the traveller. Waitangi has the Treaty Grounds and Carved Meeting House, there is also the Copthorne Hotel a great place to eat and relax onshore before you head off back to your Cruise Ship. Kawakawa has the Hundertwasser Toilets, and the Bay of Islands Vintage Railway.